We now have official confirmation on the full cast of Disney’s forthcoming live-action Star Wars series The Mandalorian. Lucasfilm made the reveal Wednesday via the official Star Wars site. Previously reported cast members include Pedro Pascal, playing the titular “lone Mandalorian gunfighter in the outer reaches of the galaxy,” along with Nick Nolte and Deadpool star Gina Carano, all of whom are now confirmed to star in the series. 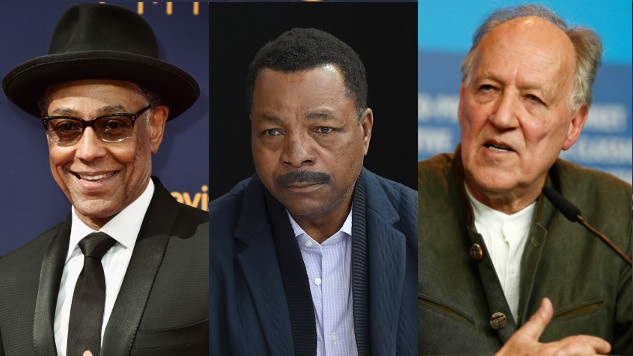 The cast now also includes Giancarlo Esposito (Breaking Bad), Emily Swallow (Supernatural), Carl Weathers (Predator), Omid Abtahi (American Gods) and, perhaps most intriguingly, legendary German director Werner Herzog, who gets billed with Grizzly Man as his most notable credit. The announcement does not provide character details for any cast members besides Pascal. “We’re having a great time working with this incredibly talented group and excited for everyone to see what we’re up to,” says writer and executive producer Jon Favreau in a statement accompanying the announcement. In March, Favreau revealed that he would be working on Disney’s first live-action Star Wars series, which in October he disclosed would be titled The Mandalorian. Directors for the series were revealed soon after. The highly anticipated series will join a second live-action Star Wars series, a Rogue One prequel starring Diego Luna reprising his role as Cassian Andor, on the forthcoming Disney+ streaming service, which launches in late 2019. The Mandalorian is currently in production, and is expected to premiere sometime in late 2019, around the time of Disney+’s launch.